I am a Sen-Sen fan and one is slowly dissolving on my tongue as I write this. They are familiar to all of us from our childhood, but I will describe them for the younger readers. 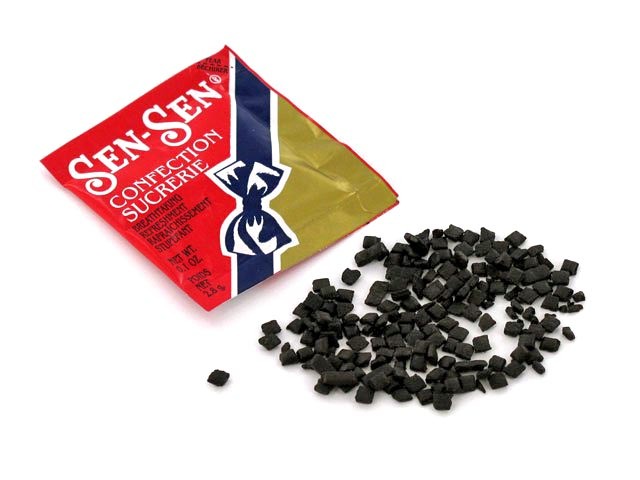 Sen-Sens are intensely flavored tiny black, flat squares based on unsweetened licorice. They are less than 1/8 inch square and about 1/16 inch thick. Put one on your tongue and the intensity is surprising for something so small. As an experiment, I timed one, and it lasted a little over two minutes in my mouth, but the flavor lingered for another ten minutes or more. They are not like M&Ms that you eat by the handful. One Sen-Sen at a time is plenty, and you won’t be wanting another soon. They were popular in my childhood and could readily be traded for other candy. One or two Sen-Sen could be traded for a Lifesaver. For many years, I thought they were gone forever, but I found they are still available at two places in Philadelphia’s Reading Terminal Market. They come in small packets about half the size of a ketchup packet. They only contain 1/10 oz. and cost $1, putting them right up there with jewels and precious metals on a pound-for-pound basis, but the packet contains about 100, and a penny apiece sounds better. Even if ordering them in bulk on the Internet, the cost is still close to $1. In our day, the packet was only 10 cents and they came in a clever tiny box within a box, sort of like a miniature matchbox. Pushing up on the inner box exposed a hole where you could shake out one Sen-Sen at a time. The company that now makes them by the original recipe is a small private company in Chicago that also makes Smith Brothers Cough Drops, a natural fit, if ever I heard of one. According to their web site, www.fffoods.com, Sen-Sen was developed shortly before the turn of the century by a man named Kerschner who was a plant supervisor at T.B. Dunn and Co., a perfume dealer in Rochester, NY. It was sold as a “breath perfume” and for many years was grouped with cosmetics. The origin of the name is lost. “Sensen” is a legitimate Japanese word for shinny or bright, but there is no evidence of any connection. As many of us can confirm, the taste has a distinctly “perfumery” flavor of violets. You either love them or hate them. Some people who try them for the first time think something has gone terribly wrong and spit them out in a panic. They commonly describe the taste as “soapy,” no doubt from the flowery fragrance. Not the usual flavor of something you put in your mouth. My great aunt always kept in her candy dish a lump of very hard, friable licorice with an equally intense flavor that looked exactly like a shiny lump of hard coal. You had to break off a tiny, Sen-Sen-sized piece by hitting it sharply with a knife handle. It tasted similar to Sen-Sen but without the perfumery flavor, and I actually preferred it. Many years later I found, by accident, a very similar product that looked like a hard, black Tootsie Roll that also had to be broken into small pieces. It probably lasted a year or two, and by then I forgot where I got it, and I never saw it again. It only cost five cents, and any company that makes a candy that sells for five cents and lasts over a year has a big problem. Note: 12/20/2018: According to Wikipedia, F&F Foods discontinued Sen-sen in July, 2013. Even their website is gone, so I guess Smith Brothers cough drops are gone, too. I was a fan of both. This entry was posted in Popular culture and tagged Helps, Licorice, Smith Brothers Cough Drops. Bookmark the permalink.